Debido a restricciones por parte del fabricante no podemos enviarle este artículo. Hi-Tec products to the European Union. These entry-level light hiking boots offer a waterproof and breathable membrane which will keep your feet dry at all times, even when the weather takes a turn for the worse. Constructed using a suede upper, the Ravus Adventure Mid provides a secure and comfortable fit. A Dri-Tec membrane keeps your feet dry by preventing water from entering inside the shoe, it also works to provide ultimate breathability by allowing cool air to flow into the shoe. In turn, Dri-Tec ensures the wearer's feet to remain cool, dry and comfortable at all times. Furthermore, a ghillie lacing system can be quickly and easily adjusted to offer the wearer a snug, supportive and personal fastening. The Eyelets are made from a Rust-proof metal which will keep the fastening system in good condition for longer, therefore allowing the wearer to receive a secure fit for a longer period of time. In addition, a padded collar and gusseted tongue provide extreme comfort and work to keep debris out. Lastly, a soft mesh lining provides instant comfort and provide a high level of breathability by allowing cool air to flow into the shoes. An impact absorbing EVA midsole ensures long-lasting cushioning and comfort. As your foot strikes the ground, the EVA midsole works to absorb shocks preventing the risks of repetitive injury, it also provides supreme cushioning for those long tiring walks. 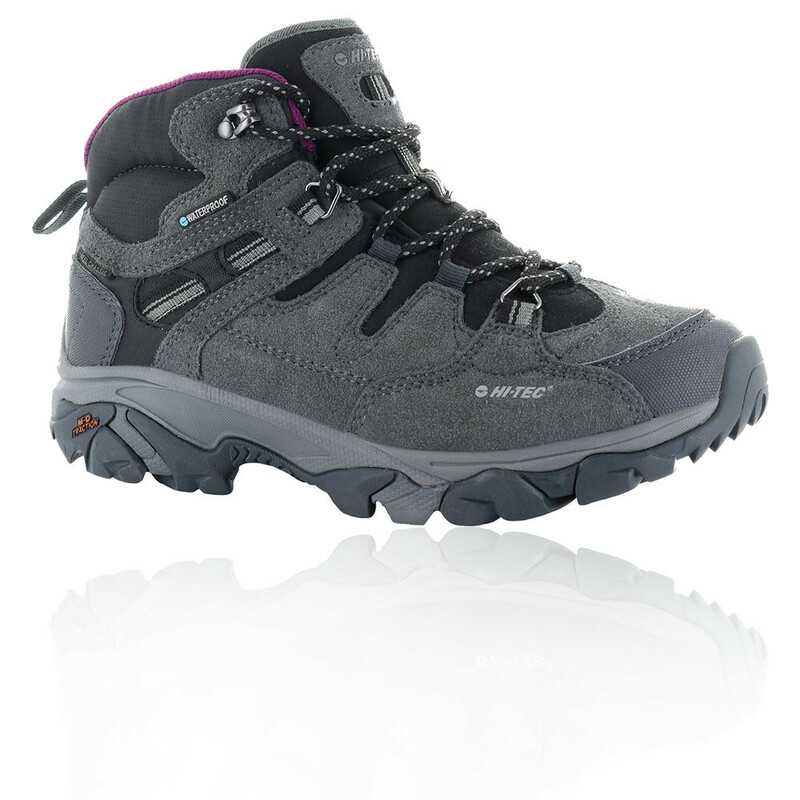 In addition, a removable EVA provides added underfoot cushioning and comfort. Lastly, a Forkshank has been added to the midsole to enhance the natural transition of the foot from heel-to-toe for much-needed support without additional weight and unnecessary bulk. Designed with an MDT (Multi-Directional) rubber outsole which offers the perfect balance of traction, protection and durability. The chamfered lugs release dirt quickly to improve traction on a variety of terrain, while the forward angled lugs encourage propulsion and the rear angled lugs encourage breaking. The lugs are opened up in flex points to ensure better flexibility when walking on rocks and to reduce foot fatigue so you can finish your walk in comfort. Sin importar si quiere salir a caminar o hacer una excursión, es importantísimo tener el calzado correcto. Hi-Tec se especializa en el rendimiento, las botas de caminar, las zapatillas, y las sandalias. Las botas Hi-Tec se construyen a los estándares más altas de la comodidad, el soporte y la tecnología que incluye las innovaciones impermeables, transpirables y ligeras más nuevas. Tenemos la mayor y las mejores de las últimas variedades en productos deportivos disponibles en el mercado. Suede Upper - Provides a secure and comfortable fit. Dri-Tec - Fully waterproof and breathable membrane. Gillie Lacing System - Quick and easily adjustable fastening. Rust-Proof Eyelets - Allowing the eyelets and lacing system to stay in great conditions. Padded Collar - Provides added cushioning and comfort. Gusseted Tongue - Prevent debris from entering the shoe. Soft Mesh Lining - Provides comfort and breathability. EVA Midsole - Provides ultimate cushioning and is shock absorbing. EVA Footbed - Provides added underfoot cushioning. Fork Shank Insert - Guides the foot safely through the natural heel-to-toe transition. Multi-Directional (MDT) Rubber Outsole - Improves grip and provides durability. Flex Grooves - Allows your foot to move comfortably across a variety of terrain.